Desperate for small bedroom storage ideas? The biggest issue with small bedrooms by far is their lack of storage and, in particular, clothes' storage. But with a little bit of creativity, even the smallest of bedrooms can become a cosy, clutter-free haven. Our comprehensive guide to small bedroom storage covers everything from storage benches to clever small bedroom furniture, and has something for everyone, whether you are on a budget, move house a lot, or are ready to invest into a more permanent solution. Storage sorted? Find out how to design the perfect bedroom in our essential guide, and browse our small bedroom decorating ideas. Let’s face it: the bed takes up by far the most room in a bedroom, especially if you have a double or king sized one. 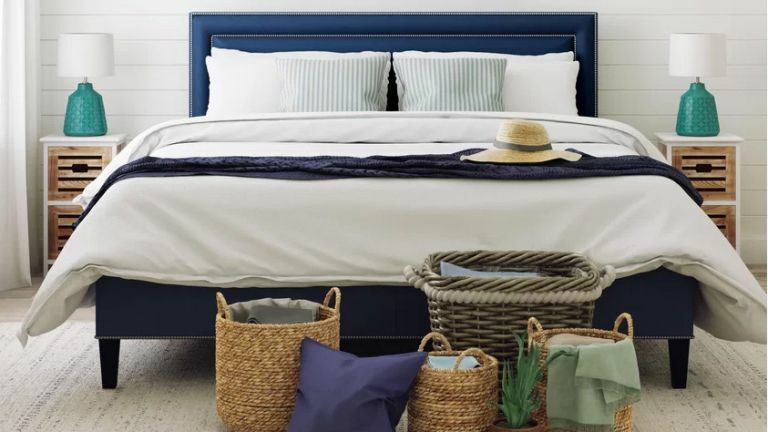 So, it makes sense to let a storage bed – take a look at our pick of the best beds with storage – do the hard work of storing bulky bedding, pillows, and duvets; moreover, if you opt for storing most of your things in the bed, you can keep the rest of your bedroom furniture minimalist and dainty. We particularly like the luxurious and smart-looking Hindon Ottoman Storage Bed from Willow & Hall – its storage compartment is split in two, which makes sorting things even easier. A wardrobe is a must-have, but it also tends to be the bulkiest, and least forgiving in small bedrooms. So why not go without? Your bedroom needn't be messy, especially if you don’t own tons of clothes – a neat wire clothing rail may well do the trick, if you only use it for your most worn items. We think the Vintage Style Dress Rail from Cox & Cox will add a touch of shabby-chic elegance to any small bedroom. If you need storage that's more substantial than a standalone clothing rail, a wardrobe with sliding mirrored doors will not only provide proper clothes' storage, but also visually enhance your small bedroom, plus you don't need to factor in floor space for when the doors are opened. Pair with neutral-coloured soft furnishings for an even more space-enhancing effect. Not all bedside tables are created equal. Many are small (though still take up floor space) and decorative, but don't earn their keep in the storage stakes. Opt for a bedside table that has drawers, shelves or both. The Industrial Style Bedside Table from Cox & Cox offers plenty of room for anything from books to a storage box, and is easy on the eye, too. Browse more of our favourite bedside tables. The key to successful small bedroom storage is never passing up an opportunity for more: if it occupies space, why shouldn’t it have storage? A headboard is no exception; many headboards come with shelving, such the one below by Loaf. A single shelf will accommodate your bedtime reads and lamp, but there are headboards with multiple shelves that could be used as storage for clothing or small items. Find all our storage headboards in our buyer's guide. We like the Nikko Solid Pine Bed with Shelves from La Redoute and the Max Platform Bed with Storage from Wayfair. Storage can be dull and unattractive – but it doesn’t have to be. Especially in a small bedroom, where you tend to notice the tiniest thing, good-looking storage options are a huge bonus. Wall storage, for example, can be made to look very smart if it is finished in a luxurious material, such as suede. We love the very handsome Mushroom Suede Ladder with Oak Rungs by H and G Designs. It almost looks like a wall feature, and, on a practical level, is great for hanging clothes and accessories. Why only have headboard storage, when you could also have wall shelving to match? This is often a neglected storage opportunity so, in a small bedroom, make sure you max it out. We love this example from John Lewis: the hardworking Super Storage Bed Frame is paired up with wall-mounted cube shelves. They are simple enough to make yourself, or can be bought cheaply on Amazon. Putting seating in a bedroom is practical but also creates a feeling of comfort. But where to stash it in a small bedroom? This is where ottomans and blanket boxes come in handy: bags of storage space for spare bedding or out of season clothes, and somewhere to perch. We like the opulent and touchable Linen Look Blanket Box from Angel and Boho. For more ottoman designs, take a look at our guide. Limited to a single built-in wardrobe with a clothing rail and no additional storage? Banish the tangled mess that results from hanging belts, storing shoes and storing jewellery alongside clothing with the help of a storage unit with drawers with proportions so neat you can tuck it inside the wardrobe. We like the practical stackable Shoe & Wardrobe Storage Drawers from A Place for Everything. At just £12.50 each, they won’t break the bank, either. If your bed frame has space beneath it, make the most of it with clothes' storage boxes or crates. They will need to be low enough to fit under the bed, so the ones made specifically for the purpose are best, and if they have lids, the contents will remain dust-free. Our pick are the Gimse boxes from Ikea – they hold loads but, at just 19cm tall, they will easily slide into a narrow gap. If your room is tight on space, extra storage finds that are tall and narrow will be useful for storing jewellery, hanging an outfit you've just taken off (or will put on first thing) and storing makeup. The clever Zuiver Kandy Coat Stand from Cuckooland comes with a mirror and a very useful shelf; it's the ideal place to store everything you need for the day ahead. In a small bedroom, the smartest move you can make is to invest in customised, fitted storage that efficiently uses every nook and cranny in a practical way. Going down this route? Plan the unit carefully so that your storage needs are catered to, right to the last detail, whether with hanging space, shelves drawers or hooks. We like the smart, customisable Pembroke range from Neptune. Whether you like a laid back look, are renting or are looking for storage solution for a child's room, baskets are a flexible, affordable option. Ideal for sifting belts from shoes from dirty clothes from scarves and hats, invest in a selection of shapes, sizes and styles for an eclectic look. Our pick is the impressive selection of baskets at Wayfair, with prices starting at 7.99 for a Rectangular Willow Basket. Just because your bedroom is small, you don’t necessarily have to sacrifice getting ready in front of a nice dressing table. Just choose a narrow design packed with storage options, and it will hardly take up any room, and give you plenty of space to stash your stuff. We like the Oak Leaning Mini Dressing Table from the Futon Company – it is compact and comes with two storage drawers, perfect for storing makeup or hiding away jewellery, plus hooks for accessories. Browse more jewellery storage solutions. Genuinely no room to swing a cat? Keep the space clutter-free with stylish makeup storage; it may not replace a dressing table, but it will take the stress out of trying to find small items in the mornings. We like the sleek Cream Faux Leather option from Lakeland. The rule of thumb in small bedrooms is always to think height rather than width, even if you're only choosing a compact jewellery storage unit. Ditch boxy drawers in favour of a delicate, multi-tiered stand, and banish dressing room clutter for good. The Tesora Jewellery Stand by Umbra is just the ticket; slim and with tiers of different heights, it allows you to tidy up everything from necklaces to rings. Available from Black By Design. Genuinely have no space for a wardrobe, but miss the elegant look and the ability to hang stuff up? Go for a wardrobe-like compact storage unit that will have doors and drawers. Even if it doesn't fit in everything, it will instantly make your bedroom feel more organised. The French Wardrobe from The Dormy House has a hanging compartment, shelving, and a top storage drawer. Impressive, given it's only 45cm wide.